We just hope you were listening, as way back on 21st January, at the very start of this expiry, in the FTSE we said; “So, that means, at the moment, there is precious little ratio from 6750 all the way up to 7050”. 6750 was also R1, and the intraday low on 28th Jan was 6734.00. Today, the corresponding R1 is lurking at 7050, just waiting to ambush this index. Worth noting is that this is backed up with R2 at 7100. The even better news is that we are only just at the half way point in this expiry. 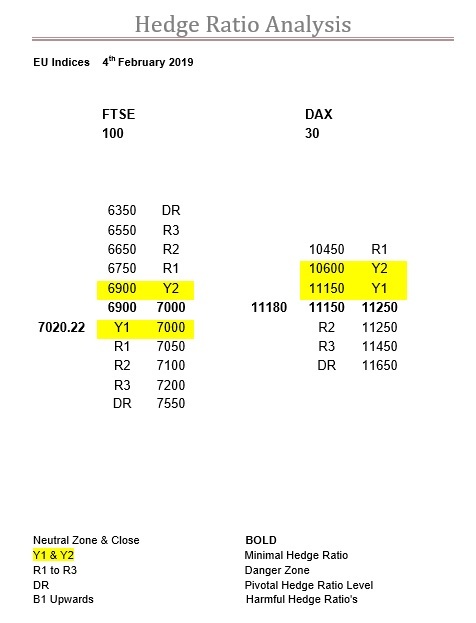 Apart from just being aware of the ratios in the FTSE it is also worth taking note of where the DAX and the US indices are in relation to their ratios. For the DAX we couldn’t have been more explicit, and again from the very start of this expiry, back on the 21st Jan, when we pointed out the zone could be anywhere in the Y1 ratio bandwidth, and the presence of R2 and R3 at 11250 and 11300 respectively. So, no surprise the zone has moved to where it is. Also, no surprise the intraday high and, so far at least, the expiry high, back on the 25th Jan, was 11321. In fact, since that high the DAX has fallen 141-points. To put this in perspective the FTSE since the 25th has risen 211-points, a very impressive 350-point divergence. Two main points to be aware of here, the first is that R3 has slipped to 11450, while the second is that there is still a huge amount of Y ratio still present. The activity has also diluted somewhat the “every man and his dog” bullishness, and if this does crack, then this index is still on the edge of a Y ratio precipice. SPX , NDX & DJX Ratio Table, levels and comment 5th Feb 2019.